Quick post, when it comes to multiple branches sitting inside single database of your Acumatica instance, we may need to assign login and access rights to different users to see different branches. So this is about tenancy that we have inside Acumatica. We can have multiple companies, or tenants, and this will be a topic for another article, and inside each tenant I can create multiple Branches. These branches, or related companies, will share same COA, same customers/vendors etc. But, important note, we can report everything separately, including VAT tax. So this is important feature for those running multiple company business under one roof. 1. Create Roles with somewhat resembling branch name or code. These security roles will be only used for branch access control. 2. 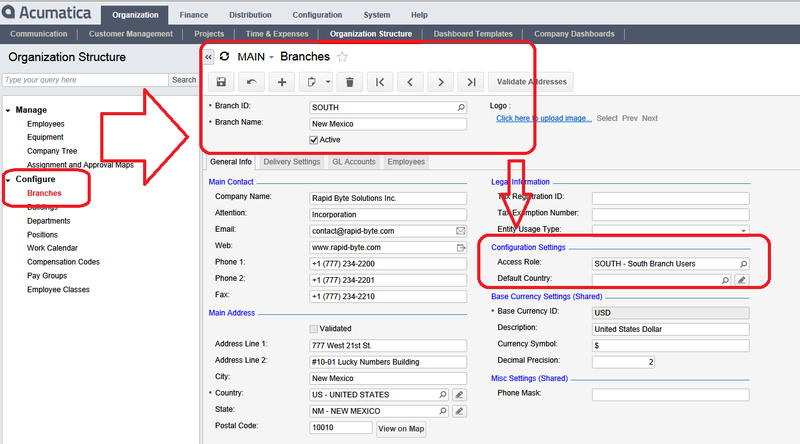 Add users to that Role, the only users who need access to South branch in my example. 3. And the last step, specify this role at the Branch maintenance screen. All access will be set automatically by the Acumatica, based on the above settings.